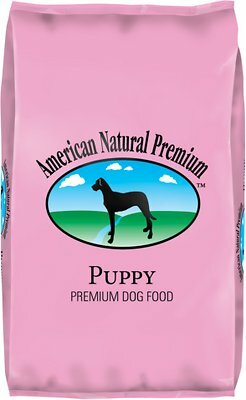 Nourish the smallest furry member of your family with the premium nutrition of American Natural Premium Puppy Dry Dog Food. Formulated for the proper nutrient absorption growing puppies need, this high-quality chicken meal provides rich levels of protein for healthy muscle growth. Contains DHA from fish meal and fish oil to support brain development and vision. The natural dry dog food includes omega fatty acids to promote healthy skin and coat. It contains calcium and phosphorus to promote healthy teeth and strong growing bones. Plus, it has added vitamins and minerals for complete and balanced nutrition. And best of all, it’s made in the USA with no corn, wheat, soy, artificial colors or preservatives. Dry dog food with high-quality chicken meal for healthy muscle growth in puppies. DHA from fish meal and fish oil helps your furry best friend’s brain development and vision. Tasty kibble with omega fatty acids for healthy skin and coat in developing pups. Calcium and phosphorus for healthy teeth and strong growing bones, plus added vitamins and minerals for balanced nutrition. Proudly made in the USA with no corn, wheat, soy, artificial colors or preservatives. Chicken Meal, White Rice, Oat Flour, Chicken Fat (Preserved With Mixed Tocopherols), Fish Meal, Pearled Barley, Dried Plain Beet Pulp, Chicken, Fish Oil, Natural Flavor, Brewers Yeast, Sweet Potato, Salt, Vitamins [Vitamin E Supplement, Calcium Pantothenate, Niacin Supplement, Vitamin A Supplement, Riboflavin Supplement, Vitamin D3 Supplement, Vitamin B12 Supplement, Thiamine Mononitrate, Pyridoxine Hydrochloride, Folic Acid], Dicalcium Phosphate, Selenium Yeast, Minerals [Calcium Carbonate, Zinc Proteinate, Ferrous Sulfate, Iron Proteinate, Copper Sulfate, Copper Proteinate, Manganese Sulfate, Manganese Proteinate, Sodium Selenite, Calcium Iodate], Dried Kelp, Yucca Schidigera Extract, Dried Enterococcus Faecium Fermentation Product, Dried Lactobacillus Acidophilus Fermentation Product, Dried Aspergillus Oryzae Fermentation Extract, Dried Trichoderma Longibrachiatum Fermentation Extract, Dried Bacillus Subtilis Fermentation Extract. The following daily feeding guidelines are a good starting point for the amount of food suggested to be fed on a daily basis. If you feed more than once per day, simply divide the daily feeding guidelines by the number of times fed per day. Pregnant & lactating females may be fed at twice the 8-2 month recommendations. Lactating females require twice the amount of food as an adult dog and should be fed 3 to 4 times per day. Feed pregnant dogs up to 50% more during the last 3 weeks of pregnancy. When switching to an adult, all life stage, or grain - free American Natural Premium Formula a gradual 5 - 7-day transition with sensitive stomachs is recommended, but not required. With American Natural Premium, there's a tasty meal waiting for every dog, at every age. 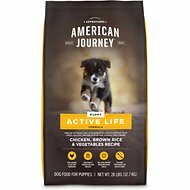 Whether you're looking for a certain restriction, shopping for a sensitive or active fur baby, or just looking for something flavorful, the folks at American Natural Premium provide healthy, delicious and quality recipes for each furry family member. You never need to wonder what this brand values—it's right on the bag! American Natural Premium always stands by the same, three principles: American Made, Natural Ingredients and Premium Quality. That means real meat, rich grains, and absolutely no corn, wheat, soy or artificial colors, flavors or preservatives. They use only the finest natural ingredients to provide the best for your pal. 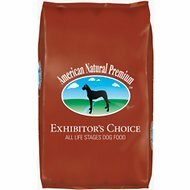 The pet-lovers at American Natural Premium worked with nutritionists, veterinarians, trusted breeders and rescue groups to formulate every quality, nutrition-packed recipe. Their mission is to ensure every dog is fed a quality meal every night—which means they strive to make their food affordable, so your pups can get the nutrition they need and deserve without you breaking the bank. 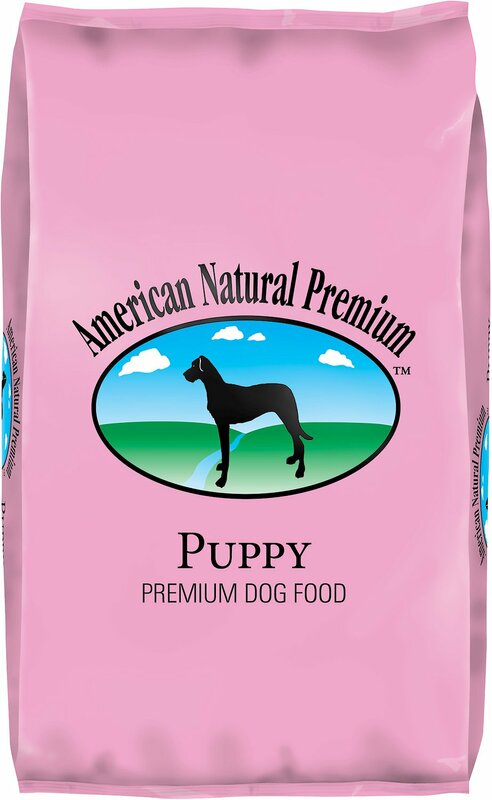 American Natural Premium's mission is to improve the lives of pets through premium nutrition. Their range of delicious, natural foods are crafted in the Midwest with only the highest quality ingredients. Each recipe is cooked in small batches at low temperatures to ensure that your pet enjoys the most palatable, digestible meal that supplies the nutrients they need for health and happiness. Pup had gained 2 much needed pounds since making the switch to this food. Ingredients sound solid and price point seems more than fair, given the ingredients. Will but again as long as pup likes it. We raised a litter of 5 English Springer Spaniel puppies and their Mother on American Natural Premium puppy food, we are very pleased with the food. Puppies ate it well and were very healthy at the 8 week health exam with our veteran. Wow I was impressed. Puppies did great on this product. Couldn't be happier. Delivery was fast too! Thanks Chewy! Our Pup Yohji love it!! Our vet recommend us this food and he loves it. I review all the ingredients and seems safe for our Pup. Best price, selection, convenience, great assistance when you need. AAAArating. I recommend to all pet owners. Our puppy Golden Retriever loves this food. Great price for the quality. Amazing packaging, haven’t feed my puppy this yet since I get her next week. But I think she’ll be okay.